This small brownish, fossorial toad species may seem unremarkable as a display animal for many zoos, yet this toad is a flagship species for U.S. amphibian conservation due to climactic and anthropogenic causes. The Houston toad is geographically restricted to eight counties in Texas, and is further restricted by habitat type, favoring deep sandy soils with prevalent canopy cover. Breeding occurs from mid-February to late May with eggs hatching within 2 to 3 days and tadpole metamorphosis at roughly 6 to 7 weeks. 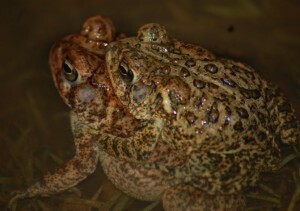 The Houston toad was the first amphibian listed as an Endangered Species by the USFWS in 1970. The main threats to extinction are habitat modification by humans and severe climactic events such as the periodic droughts and wildfire. The Houston toad, which is labeled as Endangered (EN) by both the IUCN and the U.S. Fish and Wildlife Service, has experienced significant range reduction due to extreme droughts and devastating wildfires that swept through the largest contiguous area of toad habitat, greatly reducing it in 2011. Since these events, Houston toad recovery and management efforts have been refocused and reorganized. 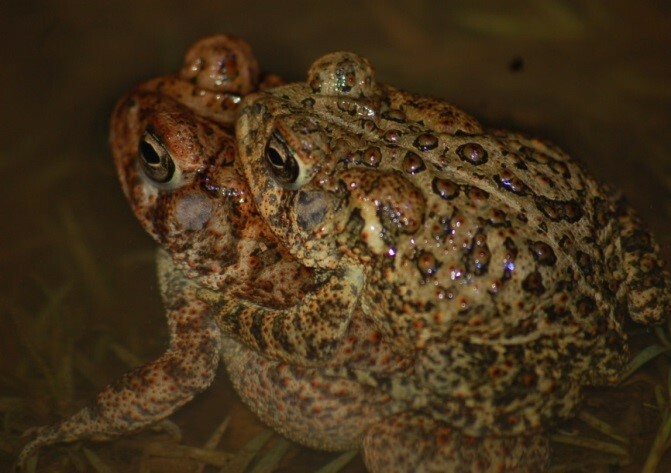 Houston toads are no longer managed as three distinct geographic sub populations, but as one range-wide population. Recovery and reintroduction efforts are no longer focused on head starting but on egg production and release. 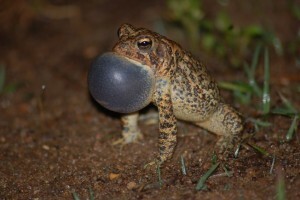 Furthermore, a renewed effort in field surveys (presence or absence) have resulted in the confirmation of toad populations in previously under surveyed areas such as Robertson County and Austin County while confirming that toads are still present in previously well surveyed and managed areas such as Bastrop County. Captive husbandry management is also paramount, as over double the wild population is held between three AZA institutions and one non-profit research institution. Within these captive populations a myriad of medical and disease issues have emerged. Most recently, a bacterial infection of Chlamydophila has confounded wild egg release due to its virulence, unreliable screening methods, and unknown origin and transmission. In all, four program goals and objectives have been established for this species: 1) Continued research into Chlamydophila infections occurring in captive populations, including the transmissibility and etiology of this pathogen, sampling of wild amphibian populations for this pathogen, and developing highly confident screening methods for captive populations; 2) Fostering and expanding current AZA and non-AZA Houston toad captive holdings for this program; 3) Maintaining a robust and reliable survey system for identify and monitoring wild populations of the Houston toad; and 4) Further developing, managing and maintaining captive assurance colonies for supplementing the wild population of A. houstonensis each year through egg releases.